Giant Sets have become known as a Hypertrophy method. Technically, based on the length of the set, its not a hypertrophy method though. Sets of a length of 40 to 70 seconds with a load that is close to maximum or the maximum are defined as strengthtraining for hypertrophy. Technically Giant Sets are endurance training and in advanced versions of Giant Sets even aerobic training. A Giant Set is 4+ exercise done in a row with less than 15 second rest in between the exercise. A Giant Set with 4 or more sets done in a row of usually 10 reps or more each will last longer than 120 seconds. Which disqualifies the Giant Set as a method of strengthtraining for hypertrophy based on classic terminology. Still Giant Sets will lead to do increase in hypertrophy when used at the right time with the right person. I even consider Giant Sets the most elite form of hypertrophy training. Thats because no other form of strengthtraining will tax the local muscular metabolism to the degree that Giant Sets do which forces the muscle to grow, if the muscle can recover from it. So based on classic terminology Giant Sets are not a method of strengthtraining for hypertrophy. To be specific, Giant Sets are a method of increasing local muscular work capacity which leads in combination with the right nutrient intake to the most severe hypertrophy gains that I have ever seen. So why do I not put everybody who wants to gain muscle on it? Giant Sets are to strength training what a marathon and ultra marathon are to running. The metabolically most demanding and elite form of training. I consider Giant Sets of up to 6-10 exercises depending on the body part similar to a marathon and more than 6-10 exercises depending on the body part similar to a ultra marathon. Which leads directly to the main drawback and misconception around Giant Sets. Giant Sets are an elite form of training, same as a marathon and ultra marathon. One doesn’t start out running and goes straight into these distances. The capacity to endure this volume of demand needs to be built. The capacity to endure this volume of demand needs to be earned. Local muscular work capacity depends on two primary factors, mitochondrial efficiency based on genetics and training history as well as absolute glycogen levels based on training, nutrient intake and size of the muscle. So, same as with running a marathon, one needs to built up capacity, specifically in this case the ability to handle loads and increase local muscular work capacity to increase absolute and relative glycogen levels by increasing glycogen storage ability and muscular size. Once you can run 5k, go to 10k, then a half marathon and then a marathon. And eventually, if its the goal, go for an ultra marathon. The exact same progress is relevant when working up to the use of Giants Sets in training for hypertrophy. Increasing work capacity can be achieved by doing more reps and more sets for a given exercise selection or just by doing more exercises per training session. In the context of Giant Sets the option of adding more exercise done in a row is the most logical and specific approach. All exercises are done for 8 to 12 repetitions with 2010 Tempo and 10s rest between, take 3 to 5 minutes rest after completing all 10 exercises, do 3 to 4 rotations of the Giant Set. The metabolic demand increases tremendously from option to option. With the Advanced Giant Set being the most challenging. Which of these training systems is best for me right now? The foundation of training is adaption. Adaption is measured in progression. In a volume oriented approach the volume is primarily measured by reps times load. That means to progress on such a training approach one needs to do more reps and eventually more load on the exercises to achieve progress with such an approach. Vice versa, this means if one of these options does not allow any measurable progress its not useful training system for given person at a given time. Try these options for 2 to 3 trainings sessions in a row and measure progress to see which options allows progress. One can use one option for one month to increase work capacity and tolerance to volume and then move to the next option. Same as first getting to run 5km in one go, then 10km, then a half marathon and eventually a marathon. And maybe even an ultra marathon. If you like to do Giant Sets because they are „fun“ or „different“ or „sweaty“ or because of any other emotionally based reason, thats ok. Still if there is no measurable progression, than its: First, not training based on the general definition of training as „following a structured program to increase performance“. And second will definitely not give you the results you are aiming for. Giant Sets challenge local muscular capacity and glycogen storage to greater degree than any other training systems in strength training. If maximal hypertrophy is the ultimate goal, built up to handle giant sets – which will take years for most – and you will set yourself up for the greatest change possible. 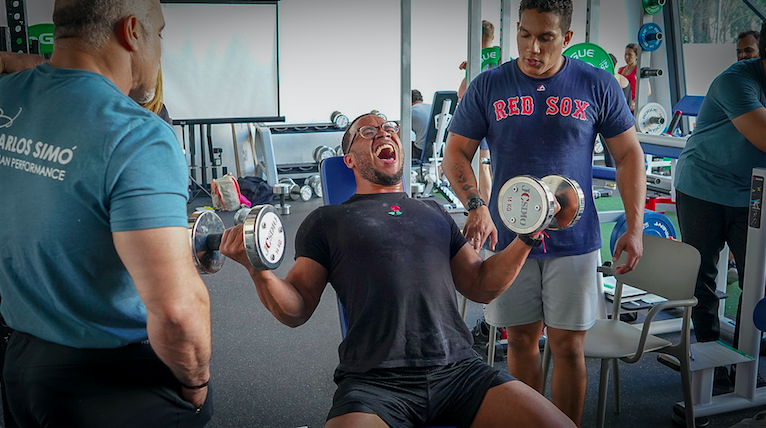 Picture: Dominican Personaltrainer Miniefly Valdez during a Giant Set for Arms, which is the first type of Giant Sets one should work up to as it involves the least total amount of muscle tissue. The pictures was taken during the JC Simo & YPSI Training Camp in the Dominican Republic in February 2019.